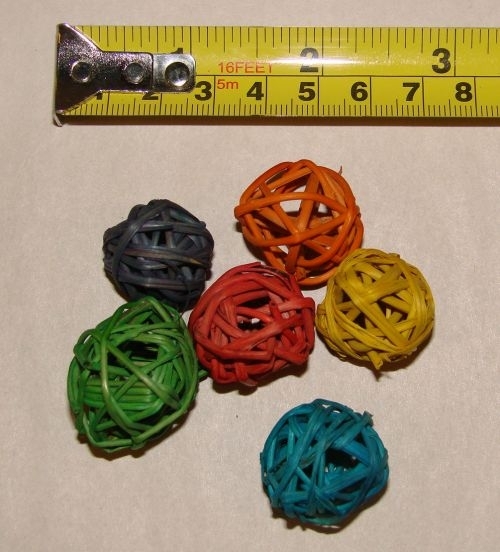 Mini vine balls.. Mini size, colored -- price is for ONE munch ball. Our pet cockatiel Ty- REALLY enjoys his latest shipment of mini munch balls! He’s really keeping himself busy !! What a good bird!! These are fun little foot toys. Our Greencheeks love their tiny size. They can easily hold them with their little feet and shred them up. They come in lots of bright colors too so I can offer them something new everyday cause they don’t last long! I place them in their tents and hammocks so it’s easy for them to reach and find. Great for little birds that love to chew. Easy to hold and chew apart. Prevents boredom.